Chilaquiles (pronounced chee-la-KEE-lays) is one of Scot’s favorite dishes. The first time he experienced it, we were on holiday in a remote part of southern Puerto Vallarta at a primitive boutique hotel in the jungle called Majahuitas. In order to find Majahuitas, one flies to Puerto Vallarta, hails a cab, drives south through town until the road ends at a pueblo called Boca de Tomatlán. Then, you grab your bags, roll up your pant cuffs or long skirt (if you are wearing them), take off your shoes and hop into a small fishing panga that takes you along the coast for twenty-five minutes to a private, secluded beach, which is home to eight various open-air bungalows set among the trees and plants and cliffs of the jungle. Staff comes everyday by boat to make food and candles, and even gives massages. Guests eat together family style and open-air, dining on the freshest of fresh ingredients from around Puerto Vallarta. Sometimes folks can eat on the beach surrounded by a heart made of homemade candles, especially if celebrating an anniversary or something else special. Candles also line all of the paths at dark, for there is virtually no electricity. Crabs and coconuts share the beach, whales pop up for a quick view and, if you want something to drink while sunbathing, just lower the adjacent flag (because lifting it would be too much work) and someone will bring a thirst-quenching treat as you relax. It was tranquil, romantic and delicious, thankfully because of the hospitable staff and owner. Chilaquiles was served at this spot. I cannot tell you if I had chilaqules before our trip to Majahuitas, but I have been making it ever since in different forms from various inspirations. I think that Scot would eat it everyday if he could. Chilaquiles is a traditional Mexican dish. LIke any country with an old gastronomical history, there is a recipe for leftover or day-old bread with which something must be done. Chilaquiles is one of those creations from Mexico. Basically and traditionally made from tortillas from yesterday’s comida and sauteed in a tomato sauce, topped with eggs and aguacate (avocado), chilaquiles is often served for breakfast or for the last meal of a celebration. And, just like every other country whose cuisines vary region to region, Mexican chilaquiles comes in many forms. 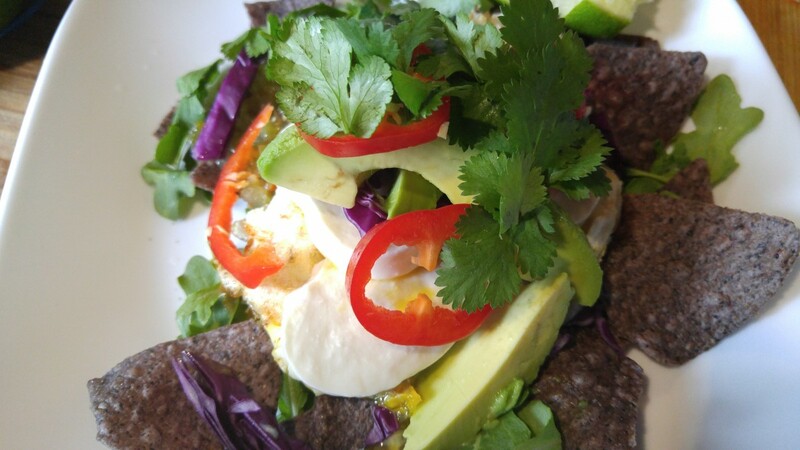 Typically, we eat ours with avocados (extra for Scot); a light, white soft cheese; something piquante, such as red hot chili, especially for color, contrast and texture; an egg and red onion (for me); cilantro and lime. I use whatever tortillas we have on hand, often inspired by good quality stale corn chips that didn’t make it into the salsa or leftover corn tortillas. Sometimes I make a red tomato or tomatillo salsa, but we also use salsas we have on hand. Lately, I am loving my salsas verdes, and, while in Florida we are inspired by the in-season avocados. Chilaquiles are so good texturally, aesthetically and gastronomically that it might just change your life. It is a dish that flows well with the creative, instinctive cook. It also can be an easy gluten-free, lactose-free, vegan and vegetarian dish if one so pleases, and it is also very light. Although more fun and refreshing when certain ingredients are in season, it is quite easy to recreate a summer version in winter with high-quality store-bought ingredients. So, so good. We hope you give it a try. Here is a recent version that serves two. Prepare your garnishes and have eggs, cheese, beans and avocado at the ready. (Wait until the last minute to slice and salt the avocado.) Set aside with two medium plates. In a medium dry skillet, warm the tortilla chips or crisp the tortilla strips if using them. When satisfied with texture, keep the burner going and move the tortilla strips or chips to a plate. Sprinkle cumin seeds into dry pan and briefly toast, then add salsa. Stir salsa and cumin seeds, warming salsa through entirely until hot. Pour salsa onto tortillas and sprinkle/place cheese atop it. Quickly wipe clean sautée pan and return to burner. With a little oil and butter, fry one egg at a time (or together if using a larger pan) and sprinkle a bit of salt on them. While the eggs cook, open, slice and season the avocado. When eggs are to your liking, place onto tortillas, salsa and cheese. Sprinkle with black beans. Place three avocado slices onto each dish and then garnish accordingly. The tortillas will have become soft after absorbing the salsa and wilting from heat. Add more salsa if you'd like, and don't forget the lime. I like all of the garnishes. Yum.